Ditch the takeaway and make your own version at home with Ching He Huang's Chinese chicken chow mein recipe. 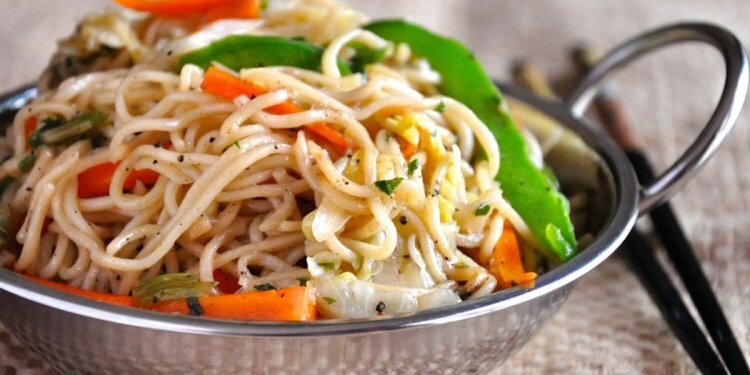 Cook the noodles for 3 minutes in a pan of boiling water until al dente or as per the packet instructions. Drain, then run them under cold running water and drain again. Drizzle with a few splashes of sesame oil and toss through to prevent them from sticking. Season the chicken with a splash of dark soy sauce, and coat with five-spice powder and mix well. Coat lightly with the cornflour. Add the red pepper and stir-fry for 1 minute, then add the bean sprouts and spring onion and stir-fry for less than 1 minute. Add the cooked noodles and season with the light soy sauce, 1 teaspoon sesame oil. If you like, stir in the chilli sauce and ground black pepper. Stir well and serve immediately.